Dong Baozhong’s peport mainly from the introduction, domestic and foreign as well as Yunnan fresh cut flower situation. Yunnan fresh cut flower logistics information technology construction and the final outlook and other aspects of the report. In the discussion, associate professor Yin Fang pointed out that the innovation of the report was not outstanding, and whether it was feasible to establish a logistics system in Dounan; Dr. Wang Changmei and Dr. Yang Bin jointly pointed out that the links between the contents of the paper were inadequate; Dr. Han Benyong pointed out that the number of keywords were insufficient, and the format of English references were problematic; finally, Researcher Zhang said that the necessity and feasibility of the article were the key points, which need to be highlighted. References should pay attention to the format and accuracy of the unit. 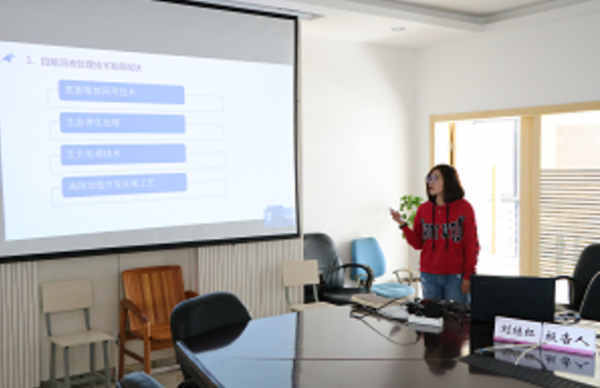 Her report was mainly divided into the introduction, different TS concentration papaya peel biogas production experiment, different pretreatment of papaya peel biogas potential experiment, IC reactor treatment of vegetable waste liquid experiment and summary of the outlook. During the discussion, Dr. Yang Bin pointed out that both sodium hydroxide and lime water played an acid-base neutralization role, activated carbon played a major role in adsorption, while enzymes accelerated acidification, so the selection of reagents should be reasonable; Dr. Han Benyong pointed out that the experimental results should be compared with the results of other fermentation experiments, and draw a conclusion after comparison. Finally, researcher Zhang Wudi pointed out that the data records should be accurate to single digits, and the volume only needs to be recorded to single digits. The experiment of adding activated carbon had appeared as early as the 1980s, and should be consulted carefully. Ding Pengli gave a report on the general situation of Mengzi pomegranate, the problems encountered in e-commerce and the corresponding strategies, methods and conclusions. In the discussion, Dr. Han Benyong pointed out: there are differences between the topic and the content of the report, which needs to be improved. Domestic logistics has a perfect system. How to highlight the bright spot, the source of funds and who will take the lead in implementing the report are taken into account. Knowledge needs to be reflected in the report, the report should be closely linked with the master's thesis, and the promotion system was not clear, can not formed a reasonable paper system. In his report, Professor Zhang Wudi introduced the comparison of two kinds of lipid, the types of antimicrobial lipid, the polar gene of lipid and the classification based on lipid structure, and finally summed up the relevant experience. Yin Fang, an associate professor of molecular biology, argued that it was difficult to associate the existing genetic level with chemical means. Can chemical means be reasonably combined with molecular ecology? The main content of Sun Jieqiong's report were as follows: introduction, walnut roasting technology in Yangbi County, feasibility analysis of popularizing hot-blast stove roasting walnut in Yangbi, popularization plan and conclusion prospect. During the discussion, Dr. Wang Changmei pointed out that the contents of the report should have references; Dr. Han Benyong pointed out that the promotion of baking ovens should have a reasonable publicity approach, specifically to the costs and costs of each link; Dr. Yin Fang pointed out that the reasons for baking hot-blast stoves should be explained and the topic should be more clearly defined. Finally, researcher Zhang Wuqi concluded that the contents of the report should be academic, logical and rigorous, the measurement units should be standardized and unified, and the contents should be expressed qualitatively and quantitatively. The main content of Liu Jihong's report were: experimental background, preparation of biogas liquid concentrate and bacteriostasis experiment, bacteriostasis experiment of extract to Fusarium oxysporum, bacteriostasis experiment of extract to Fusarium putrefaciens, and conclusion. In the discussion, Dr Yin Fang pointed out why the effect of concentrating on the extraction was better than that of the original biogas slurry; finally, Zhang Wudi, a researcher, concluded that the experimental conditions had little change and could not name the subject; what problems could be solved by going deep into each other's experiments; not equal concentration conditions. The main content of Bi Tingting's report were: walnut function, the basic situation of walnut industry intensive processing, the basic situation of walnut industry quality and efficiency enhancement, the difficulties and problems encountered in promoting Yangbi County walnut industry intensive processing, quality and efficiency enhancement, the suggestions of walnut industry intensive processing, quality and efficiency enhancement. In the discussion, Dr. Wang Changmei pointed out that the feasibility of the proposals put forward by the newspaper, and whether there was any professional evidence for them; Dr. Yin Fang pointed out: what role small papers play in large papers; finally, Zhang Wudi, a researcher, concluded that the papers need adequate preparation. The main contents of Liu Jianfeng's report were as follows: introduction, anaerobic digestion characteristics and microbial mechanism of tofu wastewater, effect of nitrogen on metabolic pathway of anaerobic digestive system and its mechanism, effect of carbon on metabolic pathway of anaerobic digestive system and its mechanism, effect of hydrogenation on metabolic pathway of anaerobic digestive system Research on the mechanism of noise, anaerobic digestion system balance and its correlation analysis, summary and prospect. In the discussion, Dr. Liu Jing proposed: why choose tofu wastewater; Dr. Yin Fang pointed out: Is it possible that one of the three systems will be the opposite, to choose a reasonable system; Finally, Zhang Wudi, a researcher concluded: Considering the different sources of C, the impact of N on the system; consult the literature to find out C and N sources The relationship between sources. The main contents of Li Wenbin's report were as follows: introduction, the necessity and feasibility of developing the circulation agriculture of combining crop with crop, the structure and benefit analysis of the circulation pattern of combining crop in Xishan village, the popularization and research of "Xishan village pattern" in Qujiang town, and the conclusion. During the discussion, Dr. Wang Changmei pointed out that the contents of the report should have references; Dr. Han Benyong pointed out that the promotion of baking ovens should have a reasonable publicity approach, specifically to the costs and costs of each link; Dr. Yin Fang pointed out: how can the introduction be concisely stated in the defense; finally, Zhang concluded. The paper concludes that the progress of the paper was too slow, and the introduction was not complete at the end.